Earlier today I was updating an article about my dream home wish list. A convenient way to prepare the dog’s Kong treats on a daily basis. Sounds frivolous, I know. But when it’s a task that you do almost daily, it’s important to you. I’m thinking along the lines of a slide-out cutting board built-into the kitchen cabinetry at counter height, and a nearby kitchen cabinet devoted to all of the dog’s treats (that I buy in bulk when they’re on sale), 16+ Kongs that get stuffed with dog treats, tall peanut butter jars, etc. Yep, I like having a dedicated dog food station area… in the kitchen! 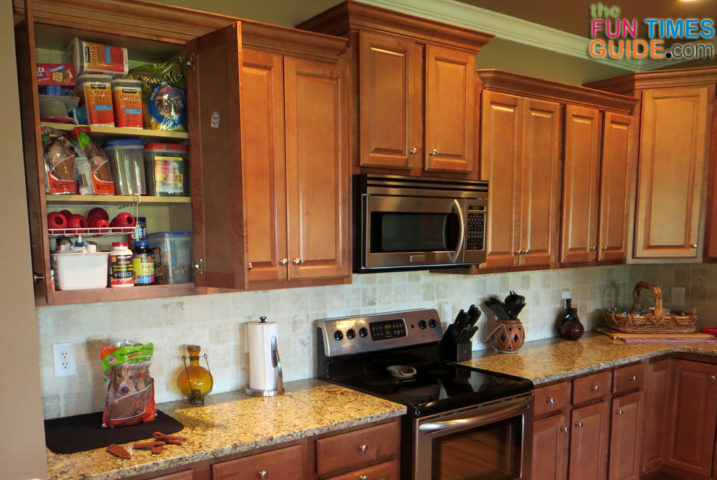 So, why do I want to store the dog treats in the kitchen? The kitchen is the most central room in our house, so it’s easy to access the dog treats at any given moment. 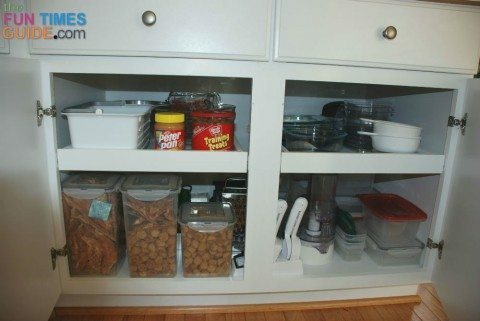 I tend to buy dog treats in bulk (when they go on sale), so I need a large cabinet space to store the wide variety of treats I buy. When unloading groceries — and dog treats — it’s easier to put everything away right in the same room. 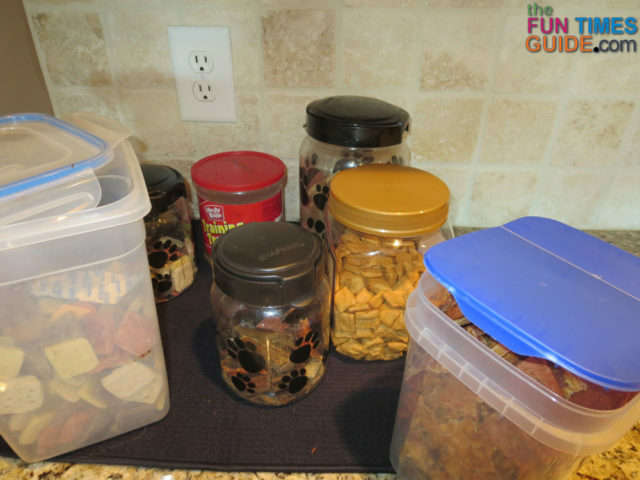 Often, I remove the dog treats from their original packaging, break them into smaller pieces, then store the treats in air-tight containers. Some of my dog’s treats are refrigerated or frozen — so it’s handy to have them all in one room whether they’re packaged, frozen, or refrigerated. When I stuff the dog’s Kong toys with treats, I usually combine some refrigerated treats with some dry treats. Then I store the stuffed Kongs in the freezer. So again, having all of those things within reach only makes sense. Since my dog gets treats randomly throughout the day (every time he does something great… and that’s a lot), I like having easy access to a variety of different dog treats at any time. When he comes back in the house after being outside he gets a treat — a routine that we started during puppyhood in order to reward him for peeing & pooping outside rather than in the house. When he goes “outside quick” which means he doesn’t spend time exploring or playing, he gets a “really good” treat — one that he desires the most and rarely gets. When he goes out to get the mail with me — and he returns with the mail held gently between his teeth — he gets a treat. When he’s doing tricks for visitors in our home, he gets a treat. When I stuff his Kong toy, he gets different treats inside — mostly soft, moist, refrigerated treats combined with a few hard treats for variety. When I fill his Buster Cube, he gets different treats inside there — mostly dry kibble; his own food. So at this point, after doling out dog treats this way for the past 8 years of his life, he has learned that getting a treat means that he’s done a good deed. Since we mostly use 2 different types of treats: one for everyday rewards (Alpo Liv-a-Snaps) and one for “really good” deeds (Chicken Jerky), I can tell that he places a different value on those 2 types of dog treats. And yes, he knows when I introduce a brand new treat into his repertoire. It’s obvious that he greatly appreciates receiving all-new surprise treats. So that’s why I like to have a variety of different treats on hand at all times — to keep him motivated and doing good deeds day in and day out. Plus, variety is good anyway… just to keep him guessing! Dogs get bored just like humans do. I can tell that he’s always excited to see which type of treat he’s getting at any given time. There’s no denying that my dog is pretty well-mannered. He’ll do just about anything on command. And he’s always eager to try something new — for a treat! Since I have so many different dog treats in storage at any given time, I need a good (convenient) place to keep them all. For me, the kitchen is the best room — for the reasons mentioned above. Specifically, the tall kitchen cabinet that’s closest to the wall (it’s literally the first cabinet you see as you approach the kitchen) is the best space in our home. 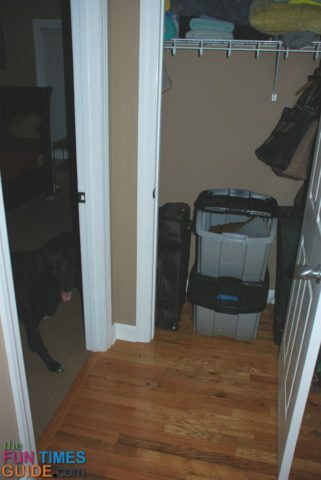 For what it’s worth, we also have a dog-proof trash can in the kitchen. 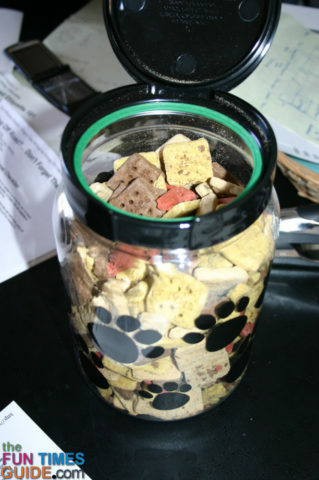 I mentioned earlier how I sometimes repackage my dog’s treats and store them in airtight containers. I rarely give my dog a full-size treat, as it was intended by the manufacturer. Instead, I almost always break them in half, or even fourths — depending on how large they are to begin with. So every few months, I spend an afternoon breaking treats and putting them into air-tight containers. 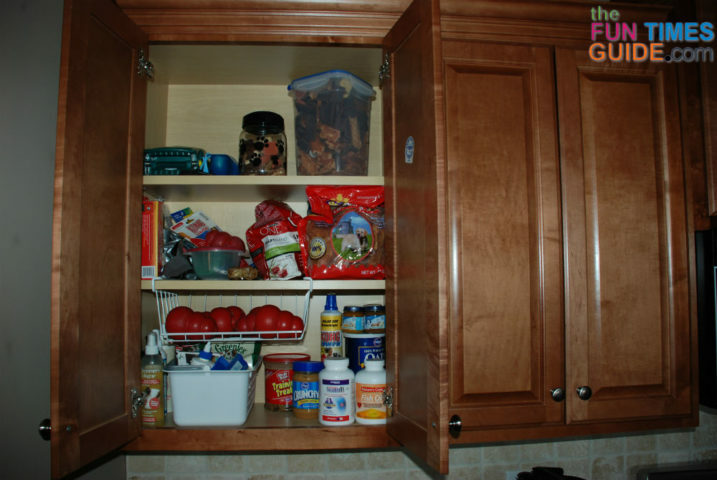 Storing things in square containers that stack nicely together helps to reduce the total amount of storage space you need. Round containers don’t help at all with that. 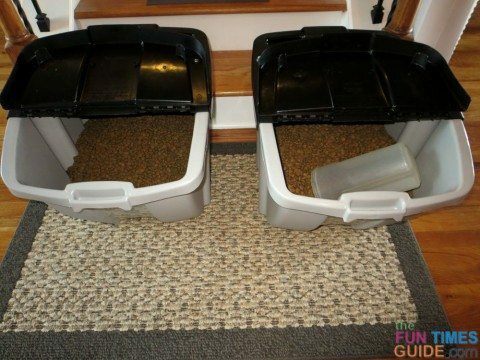 And bulky bags of dog treats half-filled with air do nothing to reduce the amount of storage space you need. I like how the dog treats stay fresher and last longer when I re-package them in air-tight containers. And because I keep a container at various locations throughout the house where I’m most likely to give my dog a treat (the kitchen, back door, office, and bedroom), dog treats are always within reach. I reuse some of the plastic containers that dog treats come in when you buy ’em in bulk — like the one that Jerky Treats Tender Strips come in. There are a bunch of small dog treat containers and larger pet food containers on Amazon as well. As you can see, I only keep the dog treats in the kitchen. 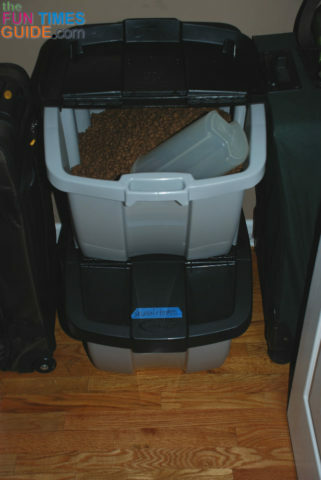 I keep the dog food in 2 pet food bins in a hall closet near the dog’s food bowls (in our master bedroom). I love the flip-top lids! They’re hinged to stay open while you’re filling up the dog bowl. Plus, the lid itself comes off entirely — which makes it a cinch to pour an entire bag of dog food into the bin. Keeping the dog food in large, stackable pet food containers like this is the perfect setup for us — because we combine 2 flavors of dog food in the dog’s bowl each time, and each container holds a 40-lb bag of dog food. By the way, for the past 7 years, we’ve been getting our dog food from a dog food delivery service called Pet Food Direct. It’s all-natural dog food. Before you think, “That’s not frugal!” I encourage you to explore the cost of buying dog food at a store compared to having your dog food delivered, as you need it. I highly recommend Pet Food Direct. In addition to being comparable in price to store-bought dog food, I like not having to lug heavy bags of dog food out of the store… into my car… and into my house every few months!